Air New Zealand will launch a second daily service between London Heathrow and Auckland flying via Hong Kong from 29 October 2006. This second service creates the world’s only current daily round-the-world service on one airline. We are developing a new 3 day tour alongside North Sailing, called ‘Islands & Fjords of the North - Sailing the <?xml:namespace prefix ="" st1 />Arctic Circle’. It’s a 3 day exciting adventure sailing on Iceland’s only schooner and offers close encounters with nature, interesting historic sites, magnificent midnight sun, sail training, whale & bird watching & so much more….. The tour will take you to Grímsey, Siglufjordur, Flatey Island, Lundey Island, Skjálfandi Bay and the deserted fords of Fjörður and is ideal for active clients, as part of your holiday to Iceland. 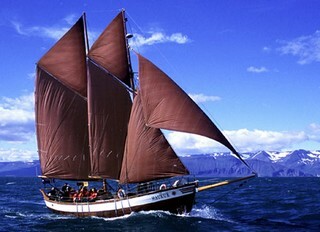 <?xml:namespace prefix ="" o />The Haukur Schooner is the only one of its kind in Iceland and is a replica of the shark fishing boats common in the area in the early 20th century. Two departure dates are available (31st May and 7th June 2006) and the tour is aimed at small groups and individuals and maximum number of passengers per tour is 6 (minimum nr. 4 passengers). Further details will be known later this month, however, why not email me now (alexis@discovertheworld.co.uk) to ensure you receive these details when they are finalised. BBC - Unforgettable Journeys to take before you die! With the latest edition in this inspiring series due for launch in March, Discover the World and Steve Watkins (the book’s author), have combined forces and will be hosting a book signing session at (The Times presents) Destinations – The Holiday & Travel Show on Friday 3rd March in Birmingham. Steve will be speaking about some of his greatest experiences in assembling the book, including an extended session about Discover the World’s 4 or 8–day Kingdom of the Ice Bear trip, visiting the ‘Polar Bear capital of the World’, Churchill, Manitoba, which is one of 30 trips Steve undertook. In October and November, as many as 1200 polar bears gather here on the icy tundra, waiting for the sea in the bay to freeze so they can wander out in search of seals. After fasting for the summer months, the bears are particularly hungry. Churchill is perched on a spit of land between the western shore of Hudson Bay and the Churchill River and for centuries, this peninsula has been the bear’s natural access point into the bay. Our polar bear watching trips to Churchill take you out onto the frozen wilderness in an enormous ‘Tundra Buggy’. Travel in comfort and safety in a specially-designed, heated vehicle with an onboard restroom and an outdoor rear viewing platform that provides outstanding watching and photographic opportunities. Steve’s talk is scheduled for 12 o’clock on Friday 3rd March. Steve will then visit our stand – Hall 17, Stand Number A02 – for the signing session where we will have only 25 copies available…so get there fast!